BACK on the MARKET; this modernized home is priced to sell quickly. Fall in love with this stunning renovated Ranch on a desirable tree-lined street. 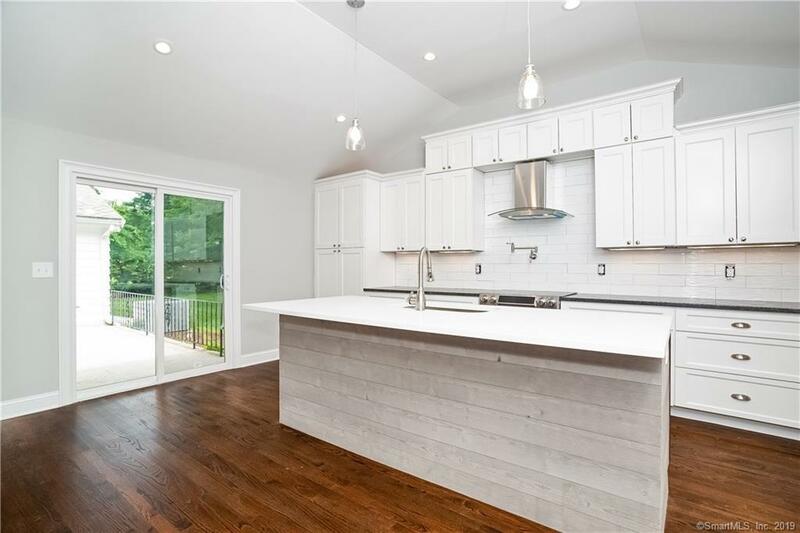 Brought down to the studs, this remodeled home features refinished gleaming hardwood flooring throughout, designer custom kitchen with pot filler, quartz counters, all new stainless steel appliances, and two large pantry cabinets. Every inch of this Ranch has been meticulously restored to appeal to today's discerning buyer. New crown molding was added for that New England charm as well as new energy efficient windows and solid wood doors. The open concept living area allows for conversations to flow seamlessly into the dining room and living area with a floor to ceiling granite wood burning fireplace. The open floor plan creates endless options for the modern family including computer and work space, lounge area, or morning coffee by the bay window. The Master Suite is a calming retreat continuing the gray and white theme into it's private bath. The two guest rooms have their own separate bath and there is a half bath off the kitchen area. Enjoy the lush and level yard as it is perfect for summer BBQ's and badminton with your new neighbors. This is truly one level living at it's finest. Come see this remodeled gem that is sure to leave you smiling from ear to ear. Within minutes to the Merritt Parkway and the Trumbull Mall. Minor work is still being completed so just enough time to add some finishing touches., Sellers have instructed me to negotiate all reasonable offers! Basement was used for flex space and storage; it is NOT finished square footage. Some minor work in progress. Gas line at the street that can be run to the house for cooking. Bathroom mirrors and some fixtures being installed.